First, some advice to travelers. You might think that because your hotel room is on the 16th floor, you don’t need to draw your curtains. Especially if it’s a lovely sunny day. And you are taking a shower. I did not get a shot of the guys on the scaffold, but like all the people I met in Milwaukee, they were very friendly. We had our meet-up at a hotel bar called “Knuckles.” I had a great plan to print out a sign, but the printer did not cooperate. So I had a book with a large roach on the cover, and a cocktail napkin with “Skepchicks!” scribbled on it to signal my location. I also had killer shiny red heels on. Fortunately, my lame napkin was enough to allow VulcanWay from the JREF forum, Rhiannonrevolts, and Jtradke to find me. As you can see, Milwaukee skeptics are a good-looking bunch! 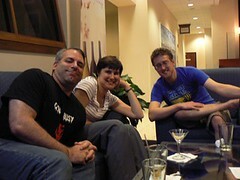 We had a great time chatting, and they tried to convince me that Milwaukee is a relatively woo-free zone. I was…..skeptical. We had a really good time playing “spot the ecologist” since about 3000 scientists were in town for the ESA meeting. We also discovered that you can see up the skirts of girls riding in the glass elevators near the bar. The photo you see above was taken just before the Debauchery turned into a Debacle. I wanted to get a picture of my cute red shoes (standard Skepchick issue) and the folks that showed up….so I stuck my foot up in the air and took a photo with my foot in the shot. Of course, I normally have coveralls or pants on because of my work, and forgot I was wearing a skirt. I don’t wear skirts much, actually. Like, never. Here you see the looks of utter shock and horror over my Sharon Stone-like cooter flash. Fortunately, they forgave me, and we went off and had some really awesome Thai food. I had no idea Wisconsin was the place to go for a good curry! Milwaukee is a lovely town–Thanks so much guys! We must party again, and I’ll wear pants next time so you’ll be safe. Major case of sympathy over here — I thought that kind of nonsense was something I had an overly-large stock share in. Personally, I would not wear red heels. I would wear my blue and green heels with the beaded dragonflies. But that’s just me! A bit off topic, but I was looking at the photos of your garden (very nice btw), and I am confused about something. Why on Earth do you people call a Courgette a “Zucchini”? I can vaguely understand why you call crisps “chips”, and trousers “pants” (which FYI makes the end of your post read a lot differently in Britain :p), but where in the world did “Zucchini” come from? It’s not even a real word! I don’t know–it’s what I learned them as. Good question! Zucchini (masculine plural)is from the Italian zucca for squash and is used in much of Italy, plus Australia and the US. Zucchine (feminine plural) is used in some parts of Italy. Courgette is the French for squash, and is used in France, the UK, Ireland and by some New Zealanders. Have to go, the sow is delivering some more piglets now! Eleven piglets this time, one injured within a few hours but stitched and now doing well. One crushed by the sow, so we’re down to 10. Next one is due in six weeks or so. Pigs keep me busy!